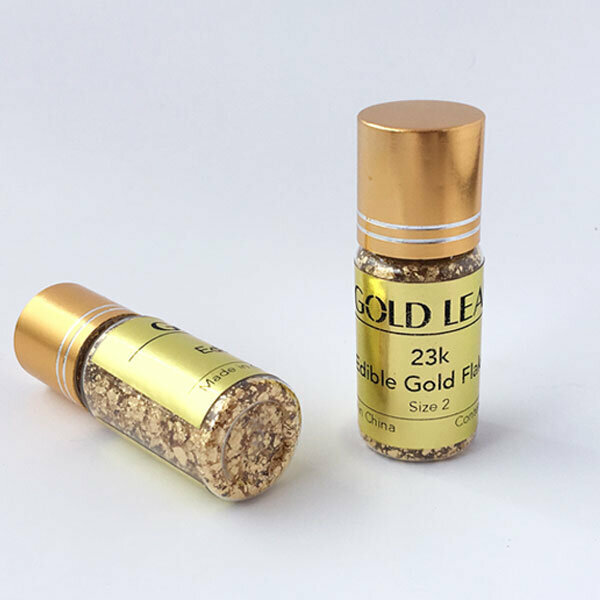 23k Edible gold flakes (flakes size 2, which is a bit gross than size 1). A luxury gift that you will earn the heart of those who you give to. Totally safe to eat. It can be used on any type of food. 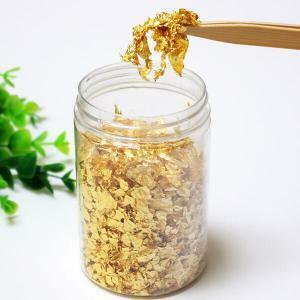 – Content 100mg genuine gold flakes. 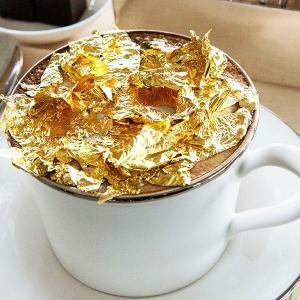 – Impress your love one by adding 23k gold flakes to the food or drinks that you serve them. – These small jars are best choice for home diners. – Chill a glass in a fridge and add few of these gold flakes in the glass then pour your drink and watch the gold flakes spinning luxuriously inside your glass. – Also suitable for decorating cakes and dishes of all kinds. 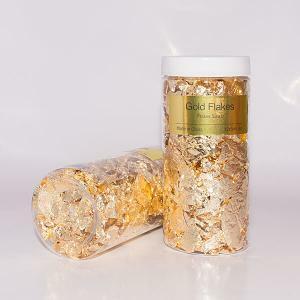 it is ideal for embellishing and lighting your table on any occasion, from the morning flat white to the special event dish, by sprinkling some of these gold flakes on top. – Always avoid touching gold flakes with your fingers. – Avoid breathing over the flakes as this will cause the flakes to fly away. – Always keep the flakes in a dry place, between 10c and 30c. 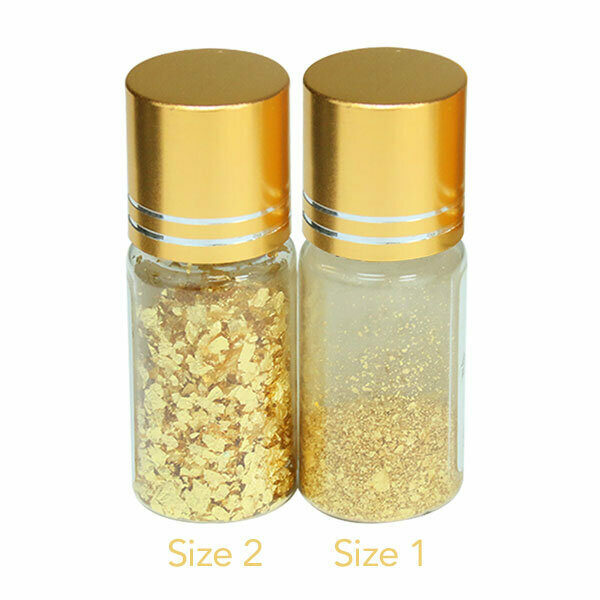 – Use the supplied edible gold or silver flakes within 3 years from date of purchase. – Ingredient: 98% gold and 2% silver. This is the ideal ration for edible gold flakes. This is a genuine gold flakes made of 23k gold and it is different from the gold dust or gold glitter that you see on the market. 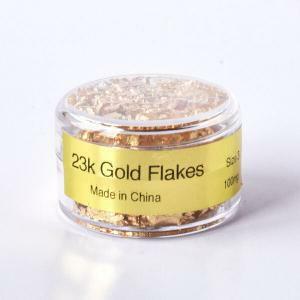 The later one is made of polyester, colouring, zinc and other alloys that is harmful for your body, even though some sellers call it 24k golf flakes still not edible. Beside that, its very cheap hence it is not made from genuine gold leafs. Comes in a luxurious little glass jar and wrapped in gold foil. In addition to its packaging, we also use thick cardboard to protect your order and to ensure your order arrive to you in good condition.